As iPhone movie converter for converting videos for your iPhone, mediAvatar iPhone Movie Converter can convert nearly all video formats like AVI, MPEG, WMV, DivX, MOV, RM, VOB, YouTube videos to iPhone MP4 video. It's also a great iPhone music converter to convert popular music files like WMA, MP2, OGG, RA, AC3, APE, CDA to iPhone music MP3, WAV, M4A, and extract audios from video files and convert to MP3 for listening on your iPhone. To make your iPhone video conversion flexible, mediAvatar iPhone Movie Converter provides more features and settings like splitting file, customizing file size and converting any segment. Download mediAvatar iPhone Movie Converter for free now. Convert your multimedia files to iPhone videos and watch them on the go! Easily convert videos like AVI, MPEG, WMV, DivX, MOV, RM, VOB to iPhone MP4 videos. Convert WMA, MP2, OGG, RA, AC3, APE, CDA audio formats and the like to iPhone music (MP3, M4A, WAV); extract background music from video files and convert to iPhone music. 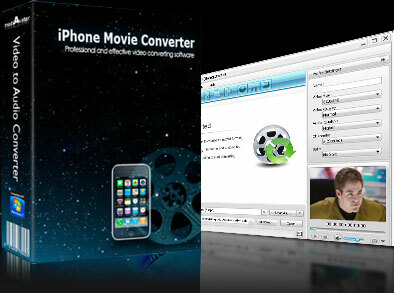 This iPhone movie converter allows you to load and convert a batch of video and audio files to iPhone movies and music. Introducing NVIDIA&reg; CUDA&trade; and multi-core CPU processing technology, this iPhone movie converter converts videos to iPhone at the highest speed possible by detecting your CPU configuration. Set diverse output profiles for one source at one time to get iPhone videos and music in one step with simpler operation and less time. Choose between splitting one file into several ones with preset size for output or compressing a large file to the size you want with the Bitrate Calculator tool. Convert any segment by setting the start point and duration as you like to remove the unwanted scenes. Provides general and advanced settings of video and audio conversion; a large range of expert settings are especially directed to more advanced requirements when converting video to iPhone. From terse interface to batch conversion support, this video to iPhone converter makes it highly simple and quick to convert multiple iPhone videos and audios. Running the iPhone video converter in background will lower its priority and get more efficiency on running other programs. Preview source file prior to iPhone video conversion; take snapshot during preview; set after done action to save trouble. Available in four language interfaces: English, German, French, Italian and Spanish. Share, backup or transfer photos and videos in your iPhone, iPod touch or iPad on PC.